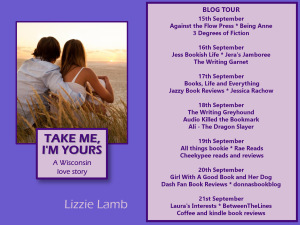 Today is my stop on the Take Me, I’m Yours blog tour! For some of the time, I was working with my formatter, Sarah Houldcroft of Goldcrest Books almost 600 miles away in Leicestershire. On one occasion I had to travel across north-west Sutherland to find a phone signal in order to finalise the last details with her. Then I was forced to sit in the car park of the Fisheries Dept in Lochinver to check through and upload the final version of the novel.